Is SnapChat for every school? It’s really too early to know if SnapChat is going to be the next Instagram and catch up for institutions. But, if you read the 6 interviews I published in this series, you’ve probably noticed a recurrent theme. All the professionals I’ve interviewed agree that what makes SnapChat different is the level of engagement you get from students on this platform. While you have to become more and more creative on Facebook, Twitter and Instagram to get SOME form of engagement, it comes naturally on SnapChat. If you’re ready to try SnapChat at your school, I’ve compiled some lessons learned and tips from your peers who have already made the jump. One might expect to see inappropriate content, but the students understand that the school’s Snapchat account is all about their college and many love to be in the limelight. We did initially out of excitement and as a means to try and track our numbers, but eventually it makes the app lag and more prone to crashing. Something that can be extremely frustrating when you’re in the middle of making a drawing to add to a Story! Snapchat is not being used by marketers because Millennials feel like it is an infringement of their privacy if used incorrectly and not many people have found a good way to use it without coming across as a disruptive marketer. We found a way around that by offering good news, being available, but not sending students personal Snaps unless they send us messages first to avoid being overbearing. One of the larger lessons learned has been the time commitment associated not only with engaging incoming content, but producing complex outgoing campaigns. At this time we have one staff intern almost solely dedicated to the platform. On a daily basis she receives upwards of 20 unsolicited snaps with which she engages and she also creates at least one strategic story each week that either coordinates with a larger initiative or showcases campus life. With Snapchat you have to let go of many of the ways you communicate on other social media platforms. The more you embrace the organic nature of Snapchat by doodling and being spirited and lighter, the more likely you are to be accepted on the platform by your fans as a brand. We have experienced with both traditionally branded messages and those with Snapchat doodles, we get more positive feedback from the latter. The more simple and fun or “real time” things often have the best results. We’ve had a great time snapping photos of things happening on campus in real time or using the drawing tool to deliver messages. Snapchat can’t just be another place you post your instagram photos, it’s a unique platform that has some real unique features that makes it a platform to explore and definitely have fun with. One of my favorite aspects of snapchat is being able to see how many people view or screen-shot a story. At Miami, like most colleges, there are so many events that take place every week. I’ve started doing a Monday morning Snapstory of all the fliers I can find that showcase campus events that will be happening that week, whether that be a movie night, a speaker, a festival, or an important deadline. Many times I see which item is “screen-shotted,” which shows me which content students are most interested in. 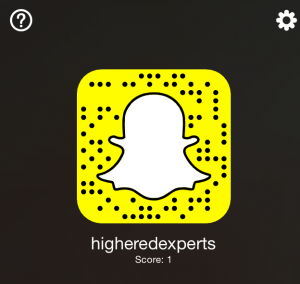 Want to experiment first, before your school jump into SnapChat? I can’t promise I’ll send amazing and funny snaps (my 5-year old can draw better than I), but I can assure you that all my snaps will be safe for work. Why not explore together? I’m starting from scratch – like many of you. And, who knows? I might share exclusive info, great examples or other things. No guarantee, but I’ll try to do my best. So, why not download the app (iTunes and Android), and add higheredexperts (that’s my SnapChat account) as a friend on SnapChat? 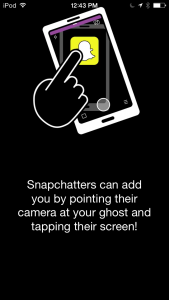 You can do it very easily by opening the app, pointing your camera at the higheredexperts little ghost above and tapping your screen.